An excellent way to organize and prep your future days according to your social or professional events, is to be guided by an app which specializes in managing your daily events, alert you whenever you need to be reminded of upcoming events and ultimately to have a more practical and powerful grip over the events that are important to you. 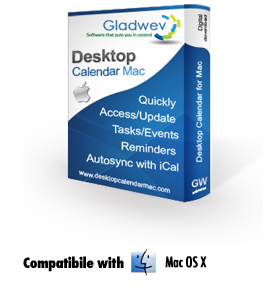 We are also the users and developers of this fantastic App Desktop Calendar for Mac to use as your personal help and assistant. It not only makes your more efficient and organized it saves you time access the most sought and used App iCalander. We as users felt there were many gaps and area of improvements which needed to be filled in iCal and we decided to create this Fabulous Desktop Calendar for Mac. The Desktop Calendar for Mac owns special attributes which come as a powerful aid for Mac users who are looking to be more organized, to manage their time better, to be reminded promptly when needed and ultimately to have a trust worthy assistant to make their lives easier and less stressful. The Desktop Calendar for Mac is perfect for Mac users in general but especially for Mac users who are already using iCal. Basically, the Desktop Calendar for Mac has been created as a powerful and useful assistant for iCal, which also implies that Desktop Calendar for Mac is actually linked to iCal, so every modification or update made in iCal will automatically reflect in Desktop Calendar for Mac as well. To instantly access the Desktop Calendar for Mac, you only need to go to Menu Bar and you will find it there in order to access it. The Desktop Calendar for Mac perfectly integrates itself with with iCal, which means that the Desktop Calendar for Mac will access all data from iCal. The Desktop Calendar for Mac also syncs with iCal, so when you make a certain modification or update in iCal, the Desktop Calendar for Mac will pick up on that and will be updated just the same as iCal. You have a special window, where you can view and choose to see reminders and upcoming events for the day/month/year in Desktop Calendar for Mac, for better visibility. Once you have selected a certain day or month in your calendar, the Desktop Calendar for Mac will display all events and reminders belonging to that certain day or month. Just like iCal and Google Calendars, the Desktop Calendar for Mac can handle multiple calendars easily in just one move. You can easily delete/edit or create new calendar events if you want to with the Desktop Calendar for Mac. Start copying events from one calendar to another in the easiest way. If you’re looking for a certain item, event or reminder, the Desktop Calendar for Mac will search it for you. If you want to know of certain upcoming events or incomplete reminders, you can filter them with Desktop Calendar for Mac successfully.